The day was spent dodging phone calls and fake improptu visits by mum and dad's next door neighbours. Overall though it was fairly quiet and relaxing, compared to what I was expecting. We would just fight because.... Well.... Because we did.... No real reason apart from wanting to dominate the other, and when older age put an end to the physical fights, the verbal and psychological fights ensued. Me and Dina were like members of opposite parties. We loved to hate each other. We competed in school for the best grades (which I got because, being bullied, I was stuck in my room studying whilst she was chasing boys...), at home to be the most popular with the family (and she was of course), in church to get to sing the solo (I always got that because she used to sing as if she was having a colonoscopy...). I think we both wanted something the other had. In my case, I just wanted the freedom she had of just being herself and being liked for herself. The friends she had, the possibility to live life in the open without being singled out. I'd love to know what she wanted that I had.... I must ask her. To me she still is in part the author of her misfortune, but I don't want to digress as I have already dedicated to this case a long and unusually sombre chapter. I had been telling Steven for such a long time about the Dead Christ Procession that takes place every year down at the village on Good Friday and I managed to build up quite a bit of anticipation in him. "Lanterns that glow in every portico and under every stone arch down the old crooked street. 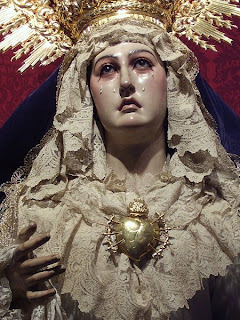 All you hear is the crying of the mourners and the steps of the crowd on the cobble stones..... Then the Weeping Virgin comes out of the church and glides silently through the streets high above the crowds, all dressed in black, a thousand rosaries dangling from her hands.... It's hypnotizing...."
"OH COME ON MAN! Of course not! Besides, although famously no man has ever seen what's under the brocaded skirt, as my grandmother happened to be one of the maidens when she was alive, and used to take my dad along, he did see what's under there..."
"Yes, he did... My grandmother did tell him to wait outside the church until she'd call him, but dad was only five, and he got scared waiting outside in the dark, so he just crept in and saw Mary totally naked, surrounded by the old screaming maidens, all trying to shield Mary's modesty.... But he did see..."
"DAD, IS IT TRUE THAT OUR WEEPING MARY IS TOO HOLY TO HAVE A MUFFIN?" I just yelled back at him. "And YES, she has no lower half of the body, she is made out of very old branches" he solemnly stated returning to his game. "See? It's all true!" I just said, looking smugly at Steven whilst pouring some more tea and cutting some more cake. "Both parts..... I can't help it... I like my food.... Why don't you ask my holy mum tonight to help me lose some weight... Cake?" I concluded. I would love to see this Procession. Nothing like that ever happens around here. I guess I could start my own but only my little Poor Claire would join me. Plus, my neighbors would say, "he's even weirder that we thought". Oh well. Sounds like a lot of fun, to me. And I haven't been a maiden in a ton of year either. You are too much. You should inform Papa that if those branches ever catch fire the result would be: the BURNING BUSH!! make sure you keep some Stolly and some Bolly on ice.... It's bound to be hot!!!! If Mark keeps hanging with us 'Mean Girls' he's bound to slip sooner or later. Bolly yes! And hopefully Patsy and Edina and Lacroix too!! No offense taken. I was sent here to save your souls. Think of me as Jesus. Well, except for a more colorful past. Plus, I didn't know my bio-dad either and to call my Mother a Blessed Virgin would be a far stretch.